AUSTIN, Texas - May 25, 2015 - PRLog -- Stockholm, Sweden, The International Association of all IT architects announces a new Iasa Fellow. The Iasa Fellowship is a recognition program for the world’s most significant contributions to the global IT-architecture profession. Today there are 14 Iasa Fellows in the world which include the likes of Grady Booch, IBM Fellow and Chief Scientist Software Engineering at IBM, Miram Grace, Technical Fellow at Boeing and Len Bass at the Software Engineering Institute, Carnegie Mellon. The fellowship was approved by unanimous vote by the Iasa Board of Directors. “Daniel gets the award for an almost decade long engagement in the IT architecture community where he has been instrumental in many areas an major accomplishments like in the development of the “Recommended IT architect roles” and the "Book of IT-architecture”. Both used as the base foundation by IT-architects in both Sweden and international organizations today”, said Paul Preiss, Chairman and CEO of Iasa and adds: Daniel embodies all fellowship attributes through his vision, innovation, passion for architecture and architects and his ability to create local value with the global mission in mind." 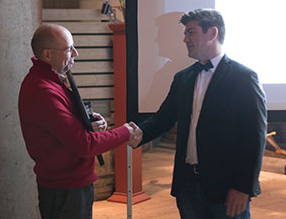 The award was presented at an event at the Vasa Museum in Stockholm on May 20’th by IASA's International Chairman Paul Preiss in the presence of 50 invited Swedish and international IT architects. Daniel Akenine is working for the Microsoft Technology Office on the long term impact of technology on social and economic development. He is a member of ISO’s international expert group for cloud standards, board member of the Swedish Computer Society and EuroCloud, teacher at the Royal Institute of Technology and chairman for Iasa Sweden. He is also the co-founder of two technology companies and holds patent applications in Europe and the United States in applied cryptography. Daniel has a previous history as a brain researcher at the Karolinska Institute, developer and architect at the Nasdaq OMX stock exchange and lead architect for one of the largest Credit Management systems in Europe. Daniel is also an established Swedish fiction writer. With over 35 chapters in 55 countries and a global reach of over 70,000, Iasa Global is the premier association focused on the network architecture profession through the advancement of best practices and education while delivering programs and services to IT architects of all levels around the world. - Check us out at http://www.iasaglobal.org, and find us on Facebook at Iasa Austin or Iasa Global.